This topic contains 2 replies, has 3 voices, and was last updated by Amanda Major 4 months, 2 weeks ago. Many times, when we think of online faculty professional development we consider workshops, courses and tutorials we can develop to assist faculty in course design and technology implementation for their online course. At my institution, the University of South Florida, Sarasota-Manatee, we offer a variety of workshops and tutorials for faculty who are “do it yourself-ers”. We also endeavor to collaborate with faculty through the design and development of their course in a semester-long process. This process is initially supported with an online faculty professional development workshop focused on instructional design principles, coupled with weekly Instructional Design consultations, and is followed by weeks of content development and course refinement. As an Instructional Designer tasked with both “traditional” methods of faculty professional development and collaborative course development with faculty, one of my biggest challenges is time and project management. Add to this list the expectation from the Board of Governors that all online courses will be reviewed to ensure that they meet Quality Matters (or similar) standards, and my head begins to spin. This year my personal professional development goal is to research project management strategies for instructional design in higher education. Specifically, I am looking at ways to streamline or combine the many “hats” Instructional Designers wear – developing and teaching Faculty Professional Development workshops, designing and developing online courses, and reviewing online courses to improve and ensure quality. I am also involved in the ID2ID peer mentorship program (https://www.educause.edu/eli/initiatives/id2id) sponsored by Educause as a “Buddy” and have been working with my buddy to compile and review resources specific to the topic of Instructional Design and Project Management over the past few months. What follows is a summary of the ideas I’ve gained and formulated based on my research as well as a set of project management strategies and flow charts that I am using to refine our processes at USFSM. In his article “Closing the Loop in e-Learning Development: How to reconnect instructional design and project management”, Bill Brandon identifies how instructional design and project management require different skills and areas of focus. While the processes run simultaneously, they do not necessarily overlap. He notes that instructional designers are interested in solving learning problems by developing content and tasks identified as needed in the Analysis phase (ADDIE) while project managers are interested in “deliverables, developer resources, schedule & budget”. An instructional designer might say “It isn’t a project until the analysis is done” while the project manager would say “It isn’t a project until it has sponsor, a scope, and a budget.” He goes on to note that “If the same person is in both roles, it’s no wonder he/she might feel a little bit conflicted most of the time” (Brandon 2004). I have felt this conflict regularly in my work with faculty to ensure that not only the course is designed with alignment and high-quality teaching strategies in place but also that the course is completed on time and within budget. In her survey conducted on the roles of Instructional Designers and Project Managers, Sharon Williams von Rooj found that the Instructional designers surveyed spent less than half their time (47%) on average completing tasks defined in the ADDIE model, and approximately another 15% of their time in tasks specific to project management (Williams von Rooj 2010). In “Instructional Design and Project Management: Which Competencies are Which?”, Williams von Rooj noted that while there are varying degrees to which Instructional Designers adhere to project management strategies, there was consistency in her research in identifying which tasks were generally thought of as instructional design tasks versus project management tasks. She goes on to identify that “Even when the roles of instructional designer and project manager are filled by the same individual, using project management processes enables the educational/training product development project manager to (a) clearly define the project, develop realistic schedules, and manage change, (b) choose those processes, levels of detail, and methodology components appropriate to the specific project, (c) operate in an organized and efficient manner, and (d) have more time to devote to the management “soft” skills, such as team building.” (Williams von Rooj 2010). In my research on this topic I am consistently finding that project management and instructional design are two distinct skill sets and that most (maybe all!) instructional designers benefit from implementing project management strategies into their work. A quick search for project management strategies will return a plethora of articles about waterfall (https://www.lucidchart.com/blog/waterfall-project-management-methodology), agile (https://luis-goncalves.com/what-is-agile-methodology/), and lean (https://leanstack.com/library/categories/fundamentals/courses/what_is_continuous_innovation/lessons/fundamental_shift) project management methodologies. While waterfall is the most traditional method with specific phases to work through culminating in a completed project, agile and lean are more iterative and flexible. These methodologies were initially developed for manufacturing or software development but can be adapted and used in instructional design. Determining the best strategy seems to be an artform to me and is based on various parameters of the project. An article from SmartSheet (https://www.smartsheet.com/agile-vs-scrum-vs-waterfall-vs-kanban) shares a helpful description of project management strategies along with principles you can use to determine which strategy is most appropriate for your project. One of my favorite sections of the article is in the section that compares agile to waterfall and shares two hybrid methods – agifall and wagile – along with definitions and uses for each. In addition to the traditional project management strategies, some leaders in instructional design have developed project management strategies specific to our discipline. Taylor Kendal from Metropolitan State University has developed a system based in Agile titled AIDNet (https://msudenver.edu/early-bird/2018/03/21-olc-award.shtml) in which courses are developed in an iterative process to allow for improvement and enhancement over time. In his presentation on this system, Taylor indicated that traditionally instructional design in higher education would focus on the design and development of a course with the goal of a completed, fancy car-type design at roll-out of the course. 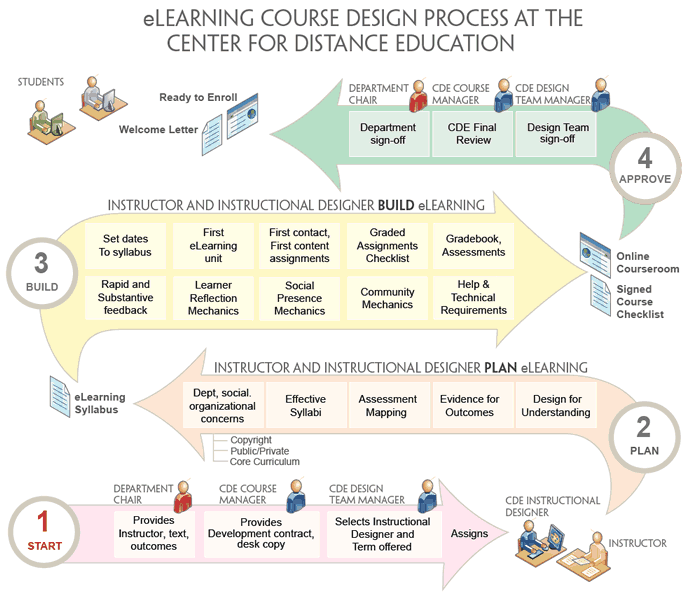 Using AIDNet, Instructional designers approach course development differently, focused on essentials for quality course design in the initial roll-out and follow up in smaller increments to improve and enhance the course. The process can be likened to building a skateboard and then enhancing to a bike and finally a car a few semesters into the course offering. This allows the design team to ensure all courses meet the basics for quality design and receive improvements and enhancements as time allows and the faculty gains expertise in teaching the course in the online environment. Allen Harris describes an enhanced ADDIE method that infuses project management which he deems “SPADES”. SPADES (https://www.td.org/magazines/td-magazine/training-in-spades) represents start, plan, administer, develop, engage, and stop. The Start phase includes stakeholder identification and needs analysis for the project similar to the Analysis phase of ADDIE. Plan includes the Design phase of ADDIE and includes project management tasks of developing “detailed plans for tasks, communications, budgets, risks, procurements, and resources.” The Administer phase includes project management tasks such as communication and ensuring tasks are completed within time and budget constraints. The Develop phase mirrors the design and development phase from the ADDIE process. The Engage phase is closely connected with the Implement phase from ADDIE. The Stop phase is a project management phase that includes final paperwork, evaluation of how well the project met initial goals, whether stakeholder expectations were met, and final accountability for allocated project resources. These resources have helped me to gain a framework for the tasks that need to be included for successful project management in instructional design work. In addition, I have gained helpful insights for improving our processes by reviewing written policies and processes developed by other universities for use in their Instructional Design projects. I hope to review additional samples of your instructional design work flow and hear how you integrate the processes of project management and instructional design in your institution. I attached the flow chart that we recently developed for use in new course development at USFSM. This is still a work in progress, but I would be interested to hear feedback and recommendations for edits from you – the Topkit community! Williams van Rooj, S. (2010). Project Management in Instructional Design: ADDIE is not enough. British Journal of Educational Technology.Vol 41, No 5, 852–864. Heidi thanks so much for this very thorough and rigorous contribution. I will share it with our instructional design team. 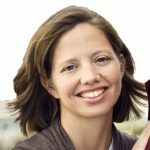 Heidi, thanks for your comprehensive post about project management and all the fabulous resources you shared. I, too, really enjoyed the article by Phare (2018) https://msudenver.edu/early-bird/2018/03/21-olc-award.shtml. Their system for allocating instructional designers time for projects makes perfect sense to me. Collaborating with academic department leadership to determine the needs for the course design and development work would enable some forethought and planning in the course development process. Instructional designers could act as project managers to coordinate the entire course development process with their team of graphic designers and developers. We usually have our faculty members act as course developers; therefore, they are more or less responsible for standing up their courses on time.